Because with two kids, and at a store other than Costco with its giant shopping carts, there is only room for one in the cart itself. The older child must be entrusted to walk alongside. Not pictured: Adrian. Erin used to be a champion cart sitter, though. I grabbed a cart from the cart area and walked it back to the car. I loaded Adrian in the seat and then I saw it. Every parent’s nightmare. There was no seat belt in the shopping cart! Now, you can never really know how you’ll handle this kind of emergency until you’re in it. I mean, sure, you can make contingency plans until you’re blue in the face and the cows have come home and the fat lady is all out of breath, but they don’t mean a damn thing when you’re right there, staring at the frayed ends of what used to be your child’s salvation. So, there I was. I was finally in it, you know? Like in it for real? Everything had hit the fan and I had to choose: Leave Adrian in the death trap, or lift him out of his seat and walk all the way over to the cart return to get a new cart. I froze. I admit it. There seemed to be no good answer. Because even if I did manage to somehow get Adrian out of the cart he was in, there was no guarantee that there would even be a cart with a working tiny buckle and thin strap waiting for me at the other end of what I knew would be an epic journey. On the other hand, sitting in a cart with no seat belt is the shopping equivalent of loading a revolver with 5 bullets and handing it to your drunk friend. I won’t tell you what I chose. I think this is one of the truly divisive issues in parenting today and I don’t want to get blogged at. Been there…having you describe it brought me back to those moments of horror! 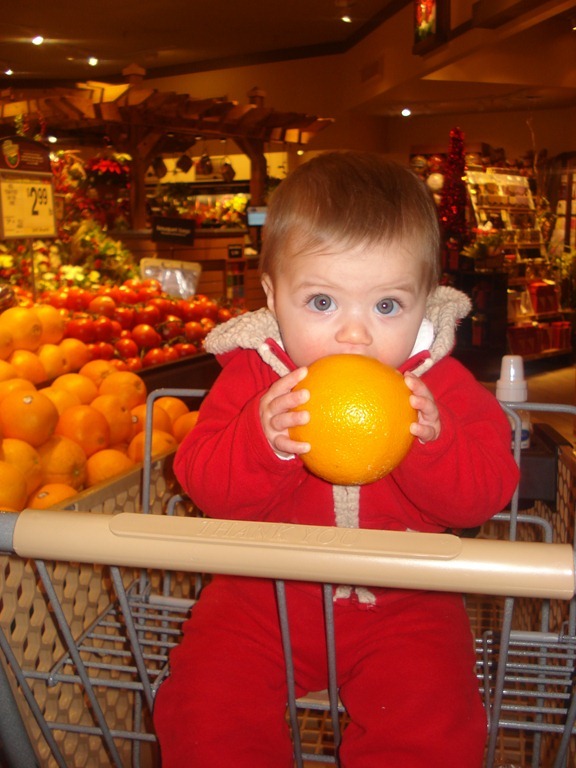 Here’s to hoping that Adrian just kept on gumming his orange….adorable btw! I can’t believe you admitted it. My husband plops a baby in and fastens the seatbelt. I have been to the grocery as older sister to seven kids, mother to four, and stepmother to four more. When my husband fastened our son in was the first time I’d ever seen the shopping cart seatbelt used. Previous Previous post: I AM AN UNCLE!!!! Next Next post: There has never been a more red-handed busting of a tiny criminal in the history of tiny criminals.